When segmenting an image, you may want to combine multiple alternative segmentations. The skimage.segmentation.join_segmentations() function computes the join of two segmentations, in which a pixel is placed in the same segment if and only if it is in the same segment in both segmentations. # Make segmentation using edge-detection and watershed. # Identify some background and foreground pixels from the intensity values. # These pixels are used as seeds for watershed. 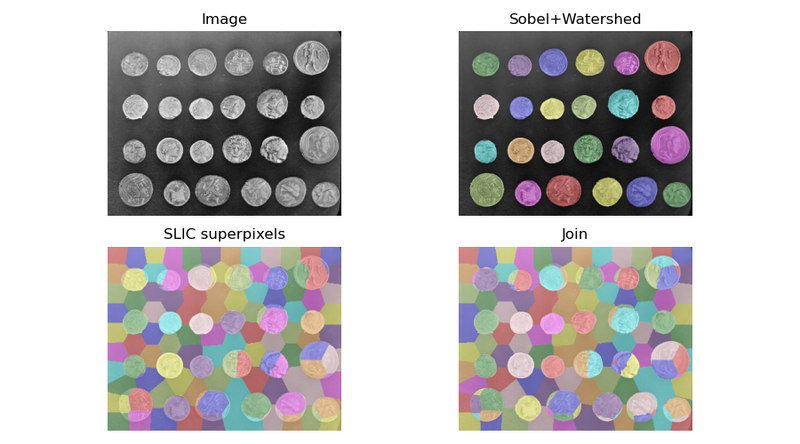 # Make segmentation using SLIC superpixels.